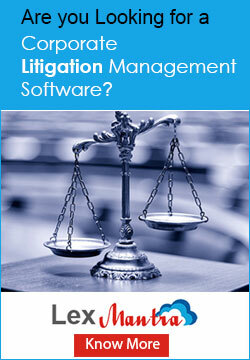 Litigation Management Software :Lex Mantra: Legal Solutions Software - Manage Corporate Workflow Hassle-Freely. Legal Solutions Software - Manage Corporate Workflow Hassle-Freely. Organization has always been a prime success factor for every industry. Evolvement of organizational methods helps firms improve their performance. Technology plays crucial role in optimizing your company legal operations through a single & secure window. Lex Mantra, a corporate legal solution is fabricated to restructure the legal workflow of a business with all-inclusive reporting rapidly. From stand-alone applications to fully-integrated enterprise system, the company offers inflexible scalable solutions, customized to meet the needs of any kind of organization irrespective of size and industry. It is very much user-friendly and hence user with little or no training can use it hassle-freely. Understanding your company’s front & back office procedures, we offer incredible legal solutions including legal workflow management software and legal date management software etc. Primarily, it manages legal workflow by effectively streamlining the legal processes. Choose right legal workflow management software and benefit in more than sales & implementation. The solution deals with facilitating management, employees, counsels of corporate to clearly use the detailed information provided by the software concerning to present legal status of cases and future plan of actions with superb responsibility allocation. Since Lex Mantra come with multi-level reporting, we easily optimize a company's legal operations through a single & secure window. So save time and resources and keep your clients satisfied.